The human body needs a number of amino acids. Acai has natural flavonoids and antioxidants?? ?Supports overall well-being**?? ?Helps enrich the vitality of your body and soul**Berries from exotic locales have often been known for their healthful properties, and Acai is a berry that has gained rapid popularity as a superfood used for health and vitality. ** Sourced directly from Brazil, this beneficial formula utilizes Acai pulp and provides you with the natural flavonoids and antioxidants that make Acai so popular. These rapid release liquid softgels ensure that the active ingredients are released quickly into your digestive system for optimum benefits. 120 softgels. . Provides dual antioxidant support ??? natural flavonoids from Acai and polyphenols from Green Tea**??? Considered an exotic ???superfood,??? Acai is famous for its contributions to overall health and vitality**??? Green Tea is a nutritional staple in Japan, where it has been treasured for centuries??? Promotes healthy cell growth and overall well-being**??? Contributes to a healthy heart**??? Our rapid release softgels are easy to takeAcai with Green Tea is a specialized blend brimming with natural flavonoids and antioxidants. Acai and Green Tea are both antioxidants, and together they help fight against cell-damaging free radicals in the body, including the heart and immune cells. ** These convenient, rapid release softgels also provide double immune system support with their antioxidant power and their ability to promote healthy cell growth. ** Enrich the vitality of your body and soul with Acai with Green Tea! New, higher potency!◊??? Sourced directly from the rainforests of Brazil??? Just two rapid-release liquid softgels a day provide natural flavonoids and antioxidants??? Supports overall well-being**??? Helps enrich the vitality of your body and soul**The Acai berry is known as an exotic ???superfood??? that stems from the Brazilian rainforests. Experience the benefits of our higher-potency Acai! **◊ Treasured for its contributions to health and vitality, Acai contains natural flavonoids and antioxidants to help fight cell-damaging free radicals in the body. ** These super-concentrated liquid softgels release rapidly into your digestive system, so that the active ingredients can provide you with the best possible benefits. Contains 3000 mg. ACAI per serving (two softgels). From the manufacturer: Provides two of natures most potent antioxidants, polyphenols and anthocyanins. Cold processed method helps preserve the rich nutrients in each chew. 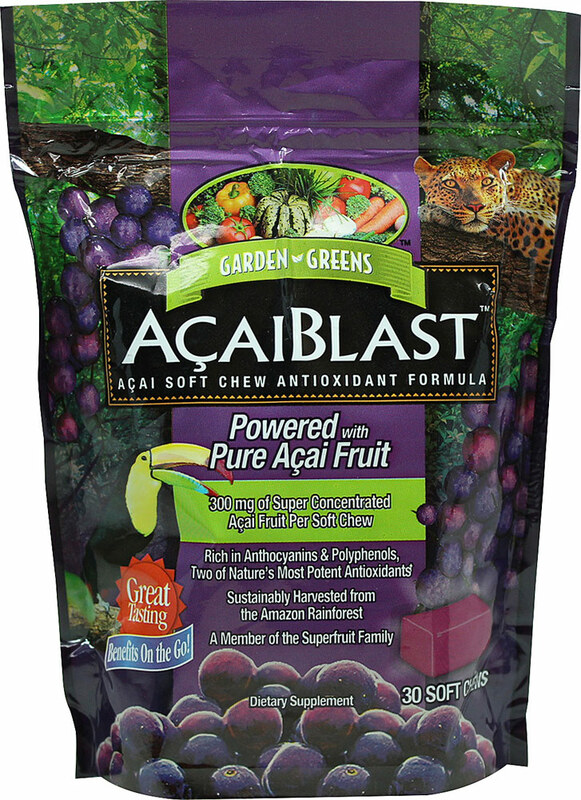 AcaiFruit gives you 300mg of energizing Acai in each delicious soft chew. Treasured by South American Indians, the Acai grows on top of lush palm trees in the heart of the Amazon rainforest. The small, deep violet Acai is part of the superfruit family because it is brimming with potent antioxidants such as polyphenols and anthocyanins. Each AcaiFruit chew is specially made using the cold processed method. This method helps to preserve the super nutrients in each chew, providing you with the best of what Mother Nature has to offer.